We’re still not sure who Stan is, but progressive metallers Periphery are celebrating him on their sixth record: Periphery IV: Hail Stan. 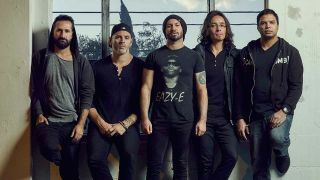 For the follow-up to 2016’s Periphery III: Select Difficulty, they left Sumerian records and struck out on their own, spending a year crafting the record. More experimental than ever, it opens with a 16-minute track featuring guest vocals from Mikee Goodman of Sikth. They tell Hammer why Periphery IV: Hail Stan is a true expression of the band, and why they’ll never compromise on their music. What was the intention behind the new record, Periphery IV: Hail Stan? Did you feel any pressure at this stage in your career to do something more commercially viable? This album is quite vast. Do you feel like you’ve moved far away from the whole djent scene at this point? Does it even still exist? There was a suggestion from your old label boss at Sumerian Records, Ash Avildsen, that you guys could think a little bit more about the commercial direction that you take and be more successful for it. You don’t ever think you could have made more of your career commercially? You’ve got Mikee Goodman from Sikth appearing on the record. How did that come about and what does Mikee mean to you as a vocalist? Also, you’ve experimented with a choir on the record. How did that come about? Is there a concept that runs throughout the record?